Krishnan Guru-Murthy: The Conservative MP Ben Bradley is in the House of Commons. He voted to Remain, then became a Brexiteer, then voted against the deal, then voted for the Deal, then said he’d struggle to back the deal again, but now says he will back the deal. Ben Bradley, why do you get to change your mind? Ben Bradley: I haven’t changed my mind. I am sorry to write to you yet again about Brexit — this must be at least the fourth time, more likely the fifth, and I assure you that I want this to go away at least as much as you do. But you will recognise that since my last letter, sent on 8th December, the circumstances have changed dramatically, and not for the better. 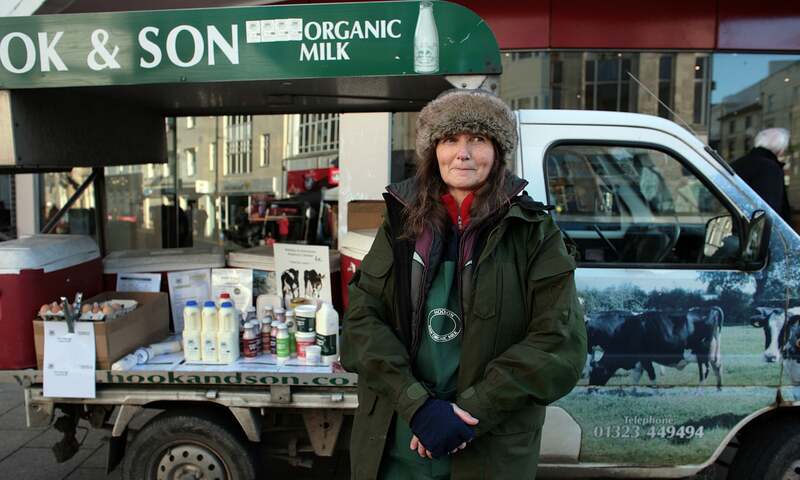 ‘We should have left on the day after’: Colette Rayner in Hastings. Photograph: Martin Godwin for the Guardian. Here, through the medium of parable, is the reason why, even though we may well leave the EU, we’re not “just leaving”. 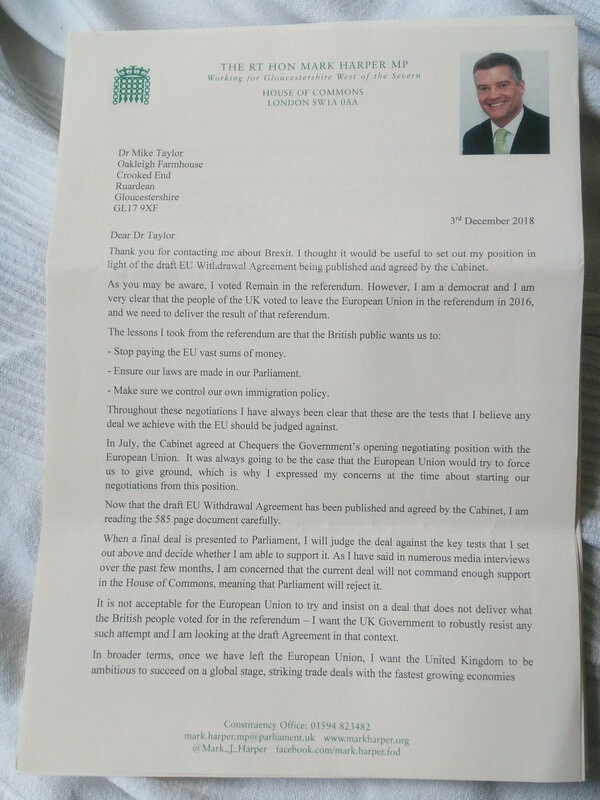 As noted in the previous post, my MP, Mark Harper, responded to my three recent letters about Brexit. Here is the letter I have sent in reply. I’m writing to thank you for your careful and detailed letter of 3rd December, in response to mine regarding Brexit. I appreciate your having taken time to address my specific points rather than simply sending a form-letter restating Government policy. It took a long time coming, but now that I have written three times to my MP about Brexit [first one, second one, third one], I have a reply — and I’m pleased to say it’s pretty good, and suggests that he actually read my letter. Enjoy. This is the third time in three weeks that I have written to you about Brexit, and I have yet to receive a reply to my first message of three weeks ago or my second of one week ago. This morning the Advocate General of the Court of Justice of the European Union ruled that the United Kingdom can decide to remain in the EU. And that we don’t need the consent of the other member states. That puts the decision about our future back into the hands of MPs. The deal on the table falls far short on what was promised, and leaves us without a proper mandate for Brexit. I urge you to vote against Theresa May’s deal, and to vote to prevent a no-deal Brexit in whatever subsequent votes may occur. We are stronger, more prosperous and more influential inside the EU than outside it. If you have a position on Brexit, I urge you also to write to your own MP. The easiest way is using WriteToThem. I just sent this to my MP, Mark Harper, via the WriteToThem web-site. It is a follow-up to my letter of two weeks ago, which has not received a reply. Two weeks ago, I wrote to you about withdrawal agreement negotiated by Theresa May and her team, asking you to vote against the deal. As I have not received a reply, I am writing again.